Egg Rolls,fried prawns,fried crab puffs,fried chicken nuggets,pork spareribs. Choice of chicken ,beef,shrimp ,veggie or combo. Chicken breast sauteed with scallions,chili,garlic and onions. Chicken sauteed with onion,zucchini,carrots,celery in chili garlic sauce. Sliced tender beef quick hair-fried with green onion ,garlic ,chili and soy sauce. Sliced tended beef,celery,zucchini,onion and carrots sauteed in chili garlic sauce. Sliced tender beef,scallions and ginger quick stir-fried with soy sauce. Semi-cripsy prawns honey roasted walnut in special sweet cream sauce. Sliced chicken beef and shrimp quick stir-fried with scallion ,ginger,garlic and soy sauce. Sliced chicken white meat shrimp and greens in our chef's special sauce. String bean and slices chicken breast meat quick stir-fried with chopped onion garlic chili. String bean and prawns with chopped onion garlic and chili. Deep fried chicken duggets sauteed in a sweet and sour chili garlic sauce. Chiaton Style roast in chili garlic sauce. Eggplant ,sring bean,fried tofu and carrots,sauteed in spicy garlic sauce. with chicken ,shrimp in our special sauce. 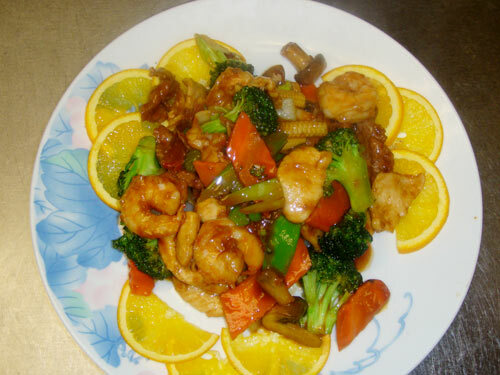 Chicken ,shrimp ,beef,calamari sauteed with gargeo greens in spicy garlic sauce. Sliced chicken ,shrimp,vegetable and won ton in chicken broth. fresh gargen ,greens in a ginger,garlic and egg blosson. .